AVELINE, P. / CREPY - Nuremberg. Map maker : AVELINE, P. / CREPY. Size : 7.8 x 12.5 inches. / 19.8 x 31.8 cm. Description :A very RARE panoramic town-view of the city of Nuremberg. 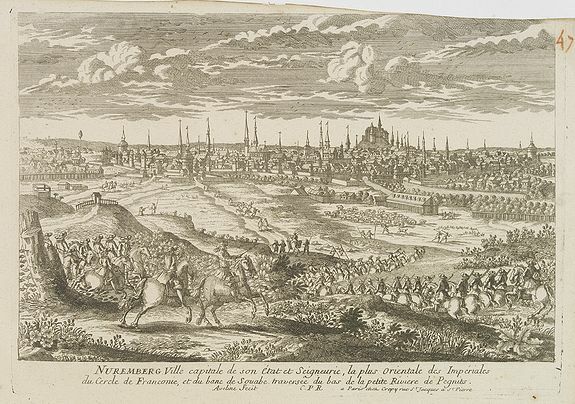 Engraved by Pierre Aveline (Paris, c.1656 - 23 May 1722). He was also a print-publisher and print-seller. He probably trained with Adam Pérelle and, like him, specialized in topographical representations. He engraved in suites many views of Paris and of provincial, European and African cities, mixing etching and burin. In 1685 he obtained a royal license for ten years, authorizing him to reproduce 'le profil des maisons royales'. Among the 412 items that comprise his |x|uvre, there are only two portraits and two prints of historical subjects. The print carries the privilege du Roy . Condition : Upper margin cut close, just shaving the upper right printed area. Dark impression.